Savings Season is a potentially dangerous application. 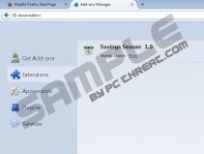 It is an adware program, so it means that Savings Season displays a lot of annoying pop-ups and other commercial offers. Technically, there is nothing extremely dangerous about this application. However, computer security experts always maintain that users should not keep the likes of Savings Season on their computers. The problem is that such applications are very vulnerable, and cyber criminals can make use of them to steal personally non-identifiable information or distribute malware. Therefore, it is important to remove Savings Season from your computer as soon as you can. To tell you the truth, we know exactly what to expect of Savings Season, because we have seen similar applications before. According to our security research, this application is identical to Coupon Champion, Bee Coupons, Sharp Savings and other similar browser add-ons. Savings Season’s developer is Exciting apps, although the name may differ from app to app. What is more, this add-on comes with an official homepage at savingsseason.com, but the direct download link is not available there. Thus, we can make an assumption that Savings Season travels bundled with a list of third party applications. The main promotion tag for Savings Season is the following: No more hunting for discounts with Savings Season! It means that with this application you should be able to find all the potential coupons and discounts on online web stores automatically. 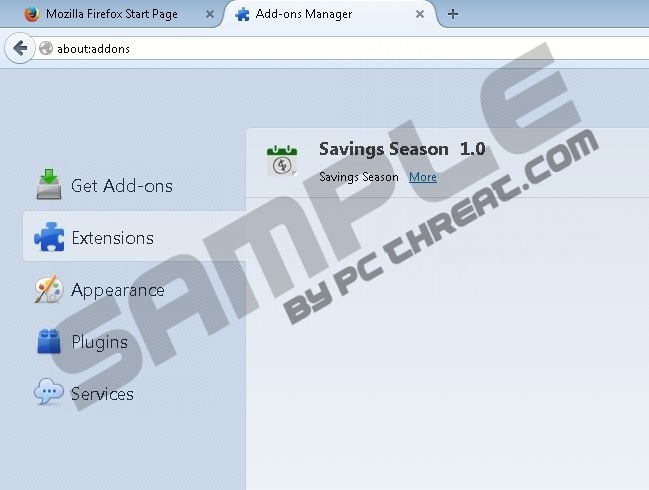 Savings Season gets installed on Google Chrome, Mozilla Firefox and Internet Explorer web browsers. Then, each time you access online shopping site (such as Amazon, BestBuy, etc. ), the application presents you with an array of shopping suggestions that should help you purchase a particular good at an optimal price. Consequently, in order to protect yourself from any potential computer security threat, you need to remove Savings Season and other similar applications from the system. Run a full computer scan with SpyHunter free scanner and you will determine whether you have other unwanted apps on the PC. Then uninstall them all via Control Panel, and scan your PC once more with a powerful antispyware tool to make sure that no unwanted or potentially dangerous files are left on the system. Do all you can to ensure your computer’s safety. Select Uninstall a program and remove Savings Season. Go to Uninstall a program and remove Savings Season. Go to Control Panel and select Add or remove programs. Quick & tested solution for Savings Season removal.